This single mom developed the field of Mexican archaeology, while fiercely protecting it from the sleazy and opportunistic. 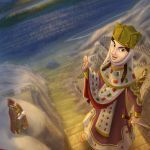 Saint, sovereign, and fiercely independent woman, she quashed two rebellions from her ex-husband, expanded her nation's borders, and ushered in a golden age. When her shogun husband cheated on her, she raised an army and destroyed the other woman's house. Later she deposed her incompetent son to become the first nun to rule Japan. First her father died. Then her sons. Then her husband. Pregnant, saddled with debt, a failing company, and an overbearing mother, Rebecca Lukens rolled up her sleeves and showed the world what she was made of: iron. America had Al Capone. Sydney had Kate Leigh and Tilly Devine - who *hated* each other. When attacked by Native Americans, this pregnant viking bared her chest, brandished a sword, and took them on by herself. And she won. The first European woman to end up in New Zealand, Charlotte Badger was part pirate, part adopted Maori, and part mom. Which part is which is somewhat lost to history. One half of the odd couple of Crimean nursing - the by-the-book Victorian rebel who revolutionized the field of medicine who stood in stark to Mary Seacole's jolly reliance on folk remedies and home comforts. When a firebreathing shapeshifting hippo menaced her people, this shaman faced it down in a magic battle - and then hurled it into space.